Sonnet #5: St John the Evangelist in Missenden Road | Me fail? I fly! 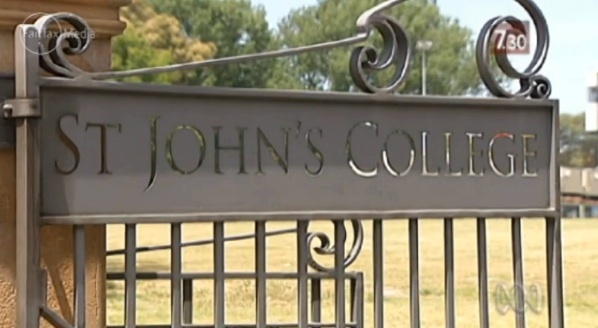 When I was an undergraduate at Sydney University, even though I was a practising Catholic, I thought of the students who lived at St John’s College as almost another species: somehow insulated from the broader university community, with their own strange rituals and vaguely noxious world view. If that was true then, how much more now! near killed, you unrepentant herd. God may forgive. His love is great. This entry was posted in LoSoRhyMo and tagged poetry. Bookmark the permalink. Add Xenophon & Windsor (not the Royal) to the Boanerges clan. Jon, maybe you can squeeze ‘quibble’ and ‘mute’ into the next sonnet, on behalf of the ruined children. You draw all the threads together – with wit and passion – and pointers towards justice! Bravo again, Jonathan! Trevor: I’m incredibly chuffed that you got the Boanerges reference, but a sonnet on priests and paedophilia is well beyond my meagre abilities. I’ve been overseas and not following blogs for two months. What a delight to come back to this! Thanks Jonathan.